Our Bodacious Dog Mom Life: Mommy. Mommy. Mommy. Look What I Did! Since then, our home office has been a warm and comfortable room that served many purposes. We've made a few minor adjustments in the months to follow. Nothing major. The love seat is still in the same spot. Lisa and the kids have spent lots of time on the love seat while I sat at my desk and worked. I've also spent many evenings on the love seat with my Chrome Book typing away. It's a great room. Earlier this Summer, we noticed tiny puffs of stuffing on the home office floor. We had no idea where it was coming from. Each day, before vacuuming, I'd pick up the nuggets o' fluff, throw them away, and continue with my housework. Not too long after, the small puffs of stuffing became bigger and bigger and bigger. Lisa and I were stumped. Where was all of the stuffing coming from? We looked all over. In every nook and cranny. Nothing. Then, one evening, we figured it out. It was after dinner. Willa wanted to play fetch. Lisa played with her for a few minutes, but then explained to her it was quiet time. No more play. Lisa and I sat on the sofa and watched Netflix for an hour or so. Lisa was the first to get off the sofa. She peeked into the home office and saw Willa on the love seat surrounded by big chunks of fluff. We were both laughing as I grabbed the camera and snapped photos. We figured out where the fluff was coming from, but there were no visible holes. Lisa went between the cushions with her hands and discovered the hole. It was between the 2 back rest cushions. Before bed, Lisa put the stuffing back in the hold and covered the backside of the love seat with a blanket. That was no match for Willa. She pulled the blanket off and proceeded to increase the size of the hole. That meant more stuffing. What amused us the most was that she was proud of her work. After taking the stuffing out, she'd make herself a little makeshift bed and nap. When we peeked in the home office, and even after going in to grab my camera, she didn't budge. We continued to put the stuffing back into the hole and cover the area with a blanket. But, time and time again, she'd pull the blanket off and make her own version of a DIY Doggy Bed. Then, last week, Willa decided to present us with her version of a grand finale. Lisa and I ate dinner at the table while playing a game of cards. When we were done with our first hand of cards, Lisa said, "Willa is much too quiet." She was right. When Willa is too quiet and out of sight, she's up to something. Lisa got up from the table and walked to the home office. I could hear Lisa take in a huge gulp of air and then laugh. "Honey, you need to see this." I wasn't sure if I wanted to. I reluctantly walked to where Lisa was standing. 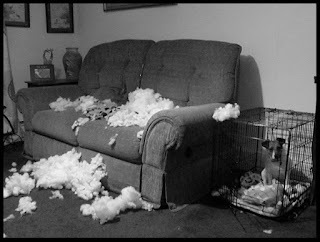 There were mounds of stuffing on the love seat and floor. The most we've ever seen from her handy-work. This time around, Willa jumped down and walked into her crate. She was proud of her work, but I think Willa realized she probably went a little too far. Lisa and I stood there laughing while I snapped a few photos. Willa, after realizing we weren't going to get mad at her, walked out of her crate and retrieved one of her fetch toys. I posted this photo on my personal Facebook wall. A friend of ours suggested I make dog bone shaped appliques to sew over the hole in the back cushion. I loved her idea and I'm totally going with it. I've got the perfect upholstery fabric in a gorgeous shade of brown. It'll contrast with the muted blue love seat in the best of ways. The down side is it'll be a project that will take me several hours. For now, we've covered the love seat with a queen sized quilt. The edges of the quilt are tucked in securely. I'm hoping to tackle the dog bone shaped appliques over the next couple of weeks.